Trips to the coast of Maine were rare as a youngster Growin’ Up in Maine. Living inland near the center of the state, the wonders of the rocky coast were more than I imagined, and a treat for young eyes. The photo shown is Thunder Hole in Acadia National Park near Bar Harbor. At the time of my visit, my Aunt announced our destination, and the thought of tourists stopping to look at a hole in a rock as waves came in seemed fairly boring. Wow was I wrong! My childhood in the 1950’s and 60’s was a life like Huckleberry Finn with swimming, fishing, and rafting on the Sebec River in a spot we called Down Back, and an occasional perch or trout fishing trip on lakes, ponds, or brooks. Before visiting the natural wonder of Thunder Hole on that trip back in 1958, we spent a day on the beach, and over the course of a few hours the tides came in and out changing the landscape in amazing ways. You just didn’t get that effect at the old swimming hole Down Back. 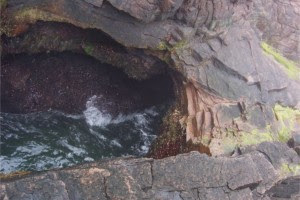 Anyway, when the timing is right the incoming tide rushes into Thunder Hole, that eroded hole in a rock that’s more like a cave, and the force of water filling the cave explodes back like the roar of thunder. That and the witch’s leg on Buck’s grave are lesser known Maine attractions I now recommend to people from away.